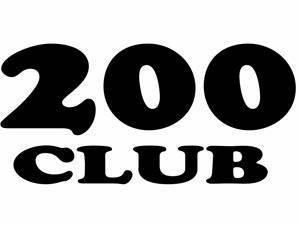 The 200 Club was set up in 1971 by the Rotary Club of Deal as a means of raising money for local charitable purposes whilst returning the major portion of the money to members in the form of prizes. Club membership is restricted to 200, with each member paying in advance an annual subscription, currently set at £48 (which it has remained for several years). Payment may be made by cheque or Banker's Order, in the latter case it can be made in instalments either annually, half-yearly or quarterly. A numbered membership card is issued to each member to cover a period of one year. An annual draw for £5,000 plus other valuable prizes. The weekly draws take place at Dunkerley's Restaurant each Monday after the Rotary Club meeting (except Bank Holidays). The annual draw is held currently at the Deal Victoria & Barns Close Cricket Club at Gun Meadow, Salisbury Road, Walmer. Details will be notified to each member beforehand. Tony Nicholls — Hon. Sec.